Porto is a beautiful coastal city in the northern region of Portugalwhere the Douro River meets the Atlantic Ocean. It is Portugal’s second largest city and a rising star among European destinations. Most famous for its production of port wine, this surprisingly affordable and breathtakingly beautiful city has seasoned travelers falling in love with its charming culture and inspiring history. Porto’s historic center became a UNESCO World Heritage site in 1996, ensuring its historical attractions are well maintained and managed as its tourism continues to increase. Porto’s long and captivating history goes all the way back to 300 BC when it was inhabited by Celtic people. As the centuries passed it was also occupied by the Romans and the Moors before it was eventually reconquered and became part of the medieval County of Portugal. Some of the historical sites that tourists can see today include the Porto Cathedral, which is the oldest surviving structure, Gothic churches like São Fransisco Church, the Clérigos Tower, as well as remaining sections of the 14th century city walls. There’s a lot to do and see in Porto to experience the past and present day life of the Portuguese people. A visit to Casa da Música shows the modern side of the city with panoramic balconies and a gorgeous, well-designed interior. A river cruise down the Douro is a look back at the past of fisherman and the rabelo boats that used to transport cargo. 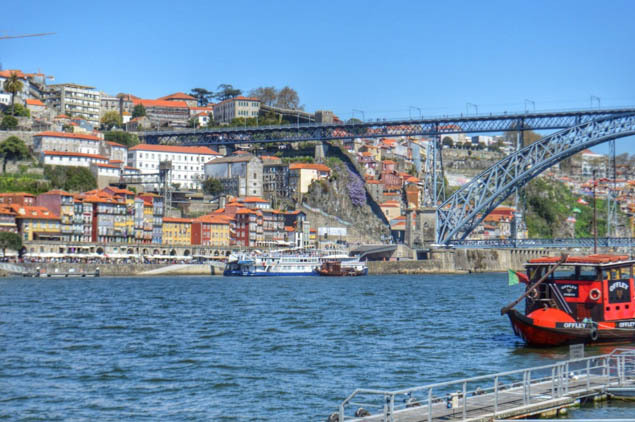 You’ll also note the six bridges connecting Porto on the north side with Vila Nova de Gaia on the south. A visit to Espaço Porto Cruz will teach you everything you ever wanted to know about port wine. The restaurant at the top of this museum offers spectacular views of the city as well. Art lovers will want to visit the Serralves Foundation which encompasses a contemporary art museum, a park and a villa. For a fun and affordable transportation experience take the traditional tramway or "eléctrico" from Passeio Alegre to the city center. A guided visit to one of Porto’s wine cellars is a great way to experience the city’s number one exported product along with a side of cured cheese. Dine at DOP restaurant for a taste of traditional Portuguese flavors with a modern flare by chef Rui Paula. For a sampling of Porto’s seafood, Fish Fixe has excellent dishes paired with a gorgeous view along the river. The absolute best seafood in Porto might be found at Os Lusíadas where they have every sort of seafood dish imaginable. Book Restaurant is the trendy place to have lunch in the former Aviz bookshop. The gastronomy in Porto is a strong and important part of the city that’s sure to delight no matter where you dine. The nightlife in Porto is energetic and lively as people crowd the streets preferring to sip their cocktails and socialize outside the bars rather than inside. The areas around Cândido dos Reis and Galeria de Paris are where the nightlife happens. This is where some of the best bars, cafes and clubs are located downtown offering diverse venues for a diverse crowd. You can take it easy with a drink and chat with some locals at a bar or party late at one of the clubs with great DJs playing pop and house music. Please drink responsibly and use a designated driver, as your RoamRight policy does not cover loss resulting from or caused by being under the influence of alcohol. What would you like to do in this stunning Portuguese city? Stay social and follow us on Twitter, Facebook and Instagram where we share even more great stories and photos! Auston grew up in Phoenix before escaping to Chicago in 2008. After 4 years working as an engineer, he sold his belongings and embarked on a round-the-world trip. After traveling non-stop for a year, he finally settled in Spain with his husband where he now calls home. When he's not traveling or writing guides about events, festivals or the best LGBT destinations, he enjoys the long sunny days and nightlife of Madrid. Read Auston's blog at Two Bad Tourists, or follow him on Google Plus, Twitter, Facebook, YouTube, or Instagram.